3. Products without proper entry number will not be accepted for judging. 5. Exhibits are to remain in place until closing, Sunday, September 23, 2018. The tent will close at 6:00 P.M. and exhibits will be available after 7:00 P.M.
6. 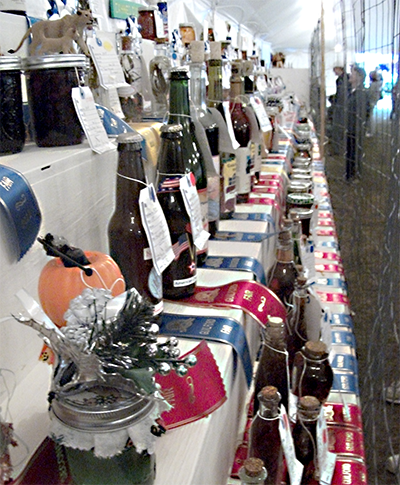 Exhibits must have been made by the exhibitor, this year. 7. All exhibits must be properly labeled, without exhibitor’s name, please. Example: Red Pepper Relish, June 2018. 8. Canned fruit, vegetables, pickles, etc., must be in standard quart or pint jars. 9. Vinegars must be in bottles. Fancy bottles preferred, uniform in height and quantity for collections. 10. Jellies and Jams must be in standard jelly glasses ONLY. NO WAX ACCEPTED IN JARS. 11. An item cannot be entered into miscellaneous if there is a class for it..ie. Raspberry Jam, Class 77. 13. Best in Show for each Category will receive a rosette. 14. Ribbons for 1st, 2nd and 3rd will be awarded in each class. 16. Collections: Please read coordinating instructions as per jar size and number of jars in each collection.